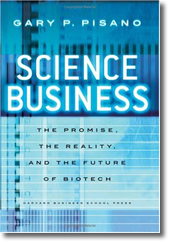 Pisano, Gary P. Science business : the promise, the reality, and the future of biotech. Harvard Business School Press, 2006. 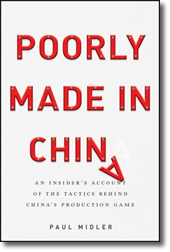 Editor’s Note: Guest Reviewer Randall Mayes reviews an older book for our blog this week. But as he points out in his review, the issues raised by Pisano regarding the biotech industry boom are especially relevant in light of today’s uncertain economic climate. In 2006, Harvard Business School professor and business analyst Gary Pisano wrote Science Business as a case study of the biotechnology industry. The significance of the book is more important today than when it was originally written. At the time, the economy was doing well, so who was asking questions? 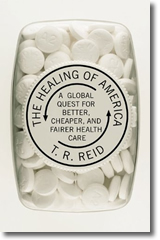 Reid, T. R. The healing of America : a global quest for better, cheaper, and fairer health care. Penguin Press, 2009. Washington Post correspondent T. R. Reid took his injured shoulder to doctors around the world to see how their health care systems would treat his shoulder pain. His American orthopedist recommended that his shoulder be replaced with a man-made titanium device. The orthopedist in France recommended physical therapy to strengthen the muscular system in his shoulder. In India, he received herbal medicines and full-body massages with sesame oil, with surprisingly good results. The purpose of Reid’s quest was to find out why health care in other free market economies have better outcomes at a lower cost than in the U.S. On basic measures of health systems performance: coverage, quality, cost control and choice, the U.S. is far behind other countries. Reid concludes that in the U.S., the cost is higher due to the complexity of our health care system and the way American health insurance is managed. U.S. private health insurance has the highest administrative costs of any health care payer in the world. Reid presents several health care models, including the Bismarck model used in Germany, Japan and France; the Beverage model used in the UK, Italy and Spain; and the national health insurance model in Canada. These countries combine universal coverage and government regulation with entrepreneurialism and respect for private markets to produce high-quality, low-cost health care for all. Kanter, Rosabeth Moss. 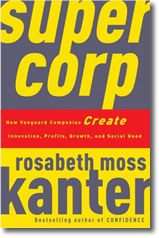 Supercorp : how vanguard companies create innovation, profits, growth, and social good. Crown Business, 2009. Harvard Business School professor Rosabeth Moss Kanter has a response to the greed-is-good argument. Her new book Supercorp shows that in agile and innovative companies, business performance and social good are intimately connected. In vanguard companies, the corporate culture is both high-performing and humanistic, and provides the foundation for sustainable growth, profit and innovation over the long term. Vanguard companies are successful and prosperous in their own right and use their core business strengths to address significant societal needs. There are numerous examples of this, including IBM’s response to the tsunami in Asia. 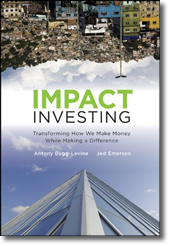 Social initiatives are usually selected without profit motive but they provide returns by enhancing the innovation process, by providing positive meaning to employees and by building goodwill in the community. Rosabeth Moss Kanter is the author of several ground-breaking and best-selling books, including Men and Women of the Corporation, The Change Masters, and When Giants Learn to Dance. Jarvis, Jeff. 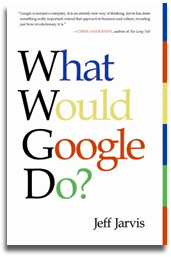 What would Google do?. Collins Business, 2009. Media leader and founder of Entertainment Weekly, Jeff Jarvis, describes Google as the first post-media company. He analyzes company principles and shows how companies, organizations and people can use Google’s worldview to re-engineer their own strategy and behavior. In business, the mass market is gone. Today’s economy is a mass of niches. Google goes to where the customers are, instead of requiring the customers to come to Google. As a network and platform, Google organizes and distributes content to an enormous market and payment is made by people and companies who want to reach that market. For example, in the old economy, the media covered the cost of publications by charging readers and viewers. In the new economy, the publications are free — media charge advertisers for reaching the customers. Author Jeff Jarvis recommends that every human being needs a search presence on Google. “Today, if you can’t be found in Google, you might as well not exist.” Exaggeration and hyperbole are abundant in this book. Yet the underlying ideas ring true and the conversational style makes this book an interesting read. This title is also available in audiobook format in Ford Library. MIT Sloan is now offering free case studies through their new web site called MIT Sloan Teaching Innovation Resources. The case studies cover the following management areas: industry evolution, sustainability, and global entrepreneurship.